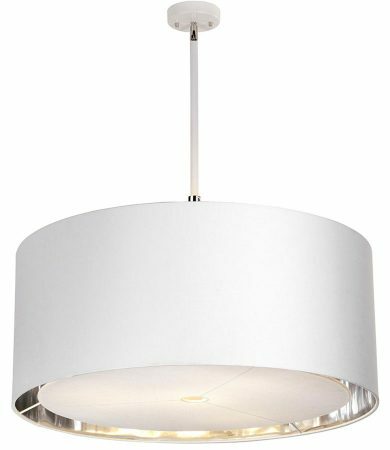 This Elstead Balance white finish 4 light extra large pendant ceiling light with polished nickel detail is contemporary and stylish. Circular ceiling mount and rod suspension finished in white, with polished nickel detail at top and shade mount. Featuring height adjustable suspension and large 70cm (28″) white fabric drum lamp shade containing four lamps, fitted with a lower baffle and lined in metallic silver for a sparkly light. A contemporary design, with a combination of white and polished nickel that add to the retro look, making it suitable for both modern and transitional settings. The very large silver lined shade gives a bit of sparkle and the baffle ensures there is no glare. Perfect for any spacious living room, dining room, bedroom or hallway ceiling. Supplied with two 30cm and two 15cm rods that can be used individually or in any combination to achieve the perfect drop, please see the technical information below for dimensions. This ceiling light is exclusive to Elstead Lighting, a British company that specialise in the manufacture and distribution of decorative lighting such as the Balance white finish 4 light extra large pendant ceiling light with polished nickel detail you see here.